Finding the best cloud spam filter is no easy task. Cloud-hosted spam filters vary considerably in their effectiveness at detecting spam email, their versatility, and their compatibility with existing operating systems and network defenses. Furthermore, some are notoriously complicated to use – placing businesses at risk from malware and ransomware if gaps are left in network defenses. At SpamTitan, we believe it is not impossible to develop a cloud spam filter that has a high spam email detection rate, is versatile, universally compatible and easy to use. We put our belief into the development of SpamTitan Cloud – a full-service email security solution that protects your business, your email users and your contacts from web-borne threats such as malware and ransomware. Real Time Blacklists and SURBL filters to detect emails from known sources of spam. Greylisting to detect spam emails sent from “not-yet-known” sources of spam. Sender Policy Frameworks to detect spoof emails disguised as genuine emails. Bayesian analysis to calculate the likely probability of an email being spam. All inbound and outbound emails are also scanned by twin antivirus engines to detect emails harboring malware or ransomware, plus businesses can select from multiple recipient verification types and authentication methods in order to further eliminate spam email from entering their networks. Businesses can also blacklist specific email addresses that SpamTitan´s reports indicate as having a high level of risk. A high detection rate alone does not make SpamTitan Cloud the best cloud spam filter for every business. As mentioned above, if a cloud spam filter is not easy to use, it can be misconfigured and create gaps in network defenses. Therefore SpamTitan Cloud has been designed with ease-of-use as a primary consideration from start to finish. Implementation of our cloud spam filter requires a simple redirection of the business´s mail server (MX) settings. Filtering parameters, user policies and rules are easy to apply via a web-based management portal with an intuitive UI. A comprehensive suite of reports enables administrators to quickly identify false positives and new threats to network security. SpamTitan Cloud is scalable up to tens of thousands of users, all software updates and blacklist updates are performed in real time at our secure data centers, and award-winning Customer and Technical Support is available around the clock. 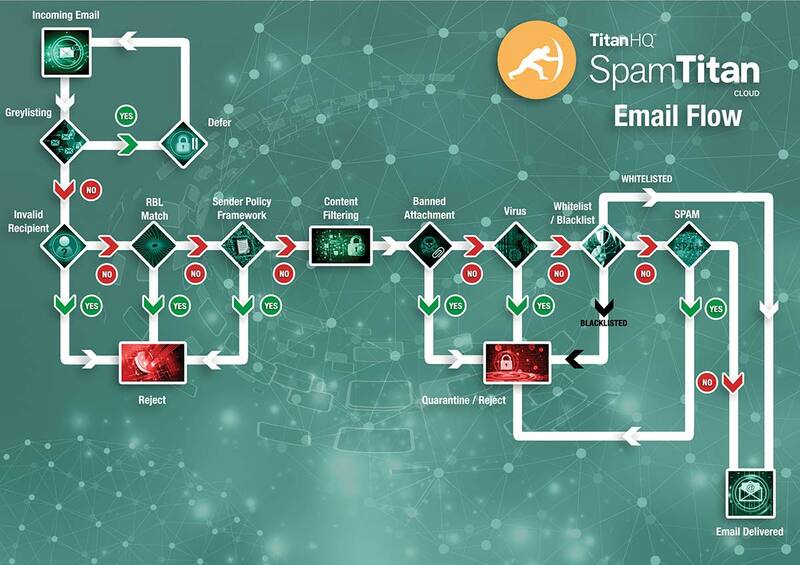 We like to think SpamTitan Cloud is a “set-and-forget” solution suitable for all types of business, but is it the best cloud spam filter for your business? We will leave that up to you to decide. If you are in the process of looking for the best cloud spam filter for your business, we invite you to try SpamTitan Cloud free for thirty days. Our free trial gives you the opportunity to evaluate SpamTitan Cloud in your own environment, experience its ease of use and high spam detection rates, and find the most appropriate acceptable spam threshold for your business. To start your free trial of SpamTitan Cloud, simply click the “Start Free Trial” button at the top of the page. Alternatively, if you have any questions about cloud-based email filtering, do not hesitate to contact us. We will be happy to answer your questions, guide you through the registration process to start your free trial and help with the implementation of our cloud spam filter if required. There are no credit cards required in order to take advantage of your free trial, no contracts to sign, and no obligation on you to continue using SpamTitan Cloud once the free trial has ended. If you subsequently choose to protect your network against web-borne threats with our cloud spam filter, we offer competitive pricing options based on the number of mailboxes you want to protect, your preferred hosting option and your preferred payment cycle. Contact us today to find out more.